Cleveland Browns rookie quarterback Baker Mayfield had enough of the criticism that FS1’s Colin Cowherd threw his way on Thursday. Mayfield appeared as a guest on Cowherd’s show “The Herd” this afternoon. 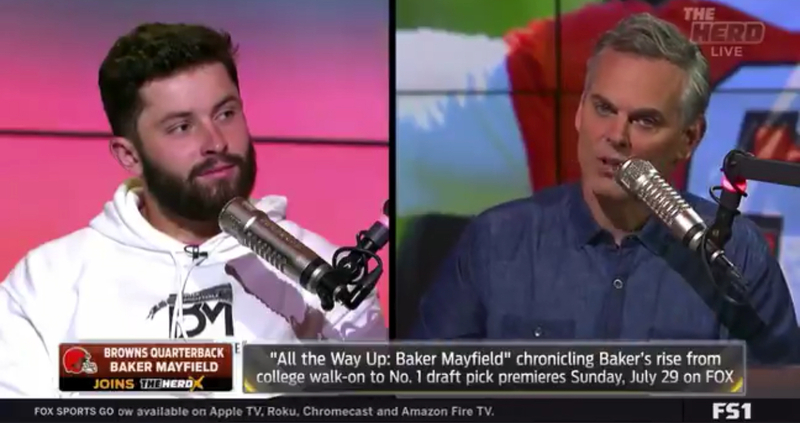 During the interview, Cowherd attempted to pick apart Mayfield over a variety of different topics. One of those was surrounding the stigma that the former Oklahoma quarterback is a bad teammate. While Cowherd attempted to portray Mayfield as the bad guy during video of a Sooners’ touchdown against Ohio State this past season, Mayfield just grinned. During the clip, the Browns’ rookie scrambled to the student section and school band while his offense celebrated. Cowherd asked why he wouldn’t rather rejoice with his guys. The Cleveland rookie followed up by asking Cowherd if he watched the entire game, including the three prior touchdowns in which he celebrated with his teammates. Mayfield also wondered where the rest of the clips were besides the one purposely plucked to make him look bad. Check out the video below of the exchange.